We hope we have been able to assist you. If you are able to assist us in helping others, please consider a tax-deductible donation. 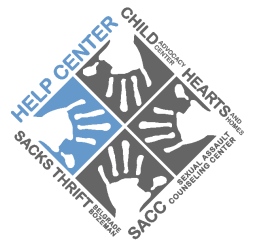 Help Center is a 501(c)3 non-profit and a registered charity in the State of Montana. Your gifts are fully tax-deductible. Your contribution can be designated to a specific program or for the overall support of our mission. All contributions, large and small, support our mission and are greatly appreciated and acknowledged. Donate online: Donate via DonorBox. Mail: checks made out to Help Center, Inc.
Did you know Sacks Thrift stores of Bozeman and Belgrade benefit the Help Center programs and services? Donate your items and help our community!